Are you finding it harder to hit your PBs, exercise as hard or as long as you once did, or make substantial gains in the gym? Well, that’s perfectly normal! As we go through our 30s, 40s, 50s, 60s and beyond, our bodies change. Typically, most people start to see a drop in their aerobic capacity and peak performance some time in their 30s. It’s also around this time that the body gradually loses its ability to build muscle and strength. Our ability to recover between workouts diminishes, bone mass declines and injuries take longer to heal. Fortunately, a combination of appropriate exercise and nutrition can help reduce age-related declines in performance. Without resistance exercise, you can expect to lose around 8% of your muscle mass per decade. This will result in a drop in your resting metabolic rate, or the rate at which your body burns calories. Add to this a drop in physical activity – or an increase in sedentary activity – and it becomes more challenging to stay lean. To maintain your current weight (or prevent gaining weight) you may need about 200 fewer calories a day in your 50s than you did during your 20s and 30s. With age, the muscles become less responsive to the anabolic effects of protein and exercise. This concept is often referred to as anabolic resistance (or anabolic blunting), and explains why it gets harder to build muscle as you get older. You may have noticed that you simply can’t get the same muscle gains as you once did despite doing the same training. Scientists believe the body slowly down-regulates muscle protein synthesis signaling. Eating more protein will help reduce muscle loss or at least off-set this anabolic resistance. People who do this maintain around 40% more muscle compared with those who eat very little protein. For active people, researchers recommend a daily protein intake of 1.2 – 1.5g/ kg body weight/ day to help preserve muscle mass and strength. It is more practical, though, to work out your protein intake per meal. Studies suggest this should be in the region of 0.4 g/ kg BW per meal (or at least 30g for a 75kg person), which is considerably higher than the recommendation for younger athletes of 0.25g/ kg BW/ day (see below for suggestions). The type of fat you consume may make a difference to your ability to build muscle. There is convincing evidence that, in terms of preserving muscle mass, omega-3s become more important as we get older. 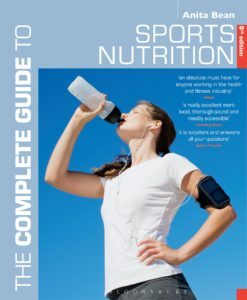 Researchers at Washington University found that daily supplementation of omega-3 fats for 8 weeks increased the rate of muscle building in older adults, while Brazilian researchers measured greater strength gains in older women who consumed a daily omega-3 supplement in conjunction with a 90-day resistance training programme compared with those who didn’t take supplements. Low blood levels of vitamin D are common across all age groups but is particularly problematic as we get older as the skin’s capacity to produce vitamin D from UV light diminishes. Low levels may reduce muscle function and strength and impair performance. Getting adequate levels of vitamin D whether from sun exposure, diet or supplements becomes more important for optimal performance. Best dietary sources include oily fish, egg yolk and liver. The Government recommend a 10 microgram (400 IU) supplement of vitamin D3 during the autumn and winter months (between October and April in the UK). As we get older our perception of thirst decreases as does our sweat rate and the ability of kidneys to concentrate urine. All this means that you’re more susceptible to dehydration so it may be prudent to drink to a planned schedule rather than relying totally on thirst. Eat 30 – 40g protein at each meal. Get this from a medium-sized (125g) chicken or turkey breast, or one (150g) fish fillet, or one small tin (120g) tuna, or 300g strained Greek yogurt, or 4 large eggs, or 400ml whey protein shake. Boost vitamin D – Adequate levels of this nutrient can help improve your bone health, boost your immune system and improve muscle performance. Get more omega-3s – As well as protecting heart health, omega-3 fats have been shown to increase blood flow to muscles during exercise, reduce post-exercise inflammation and increase the muscle-building response to a meal. Aim for one portion of salmon, mackerel or sardines a week, or 1tbsp flaxseeds, chia seeds or walnuts daily. 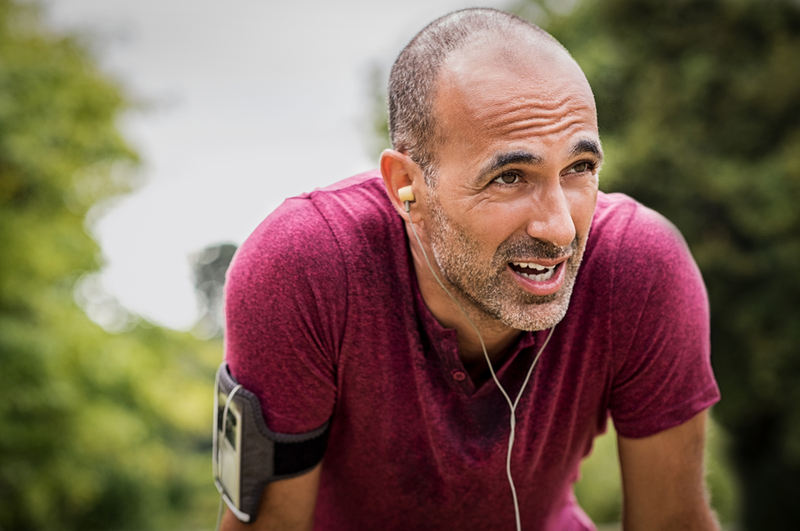 Estimate how much fluid you need to drink during exercise by calculating your sweat rate – the difference between your pre- and post-workout weight. Divide your hourly sweat rate by 4 to give you a guideline for how much to drink every 15 minutes. Consume polyphenol-rich foods – Researchers believe polyphenols – found in colourful fruit and veg – may help prevent certain age-related diseases, including heart disease, eye problems and cancer. Don’t eat less than 20% of your calories from fat. Otherwise you risk deficient intakes of fat soluble vitamins and essential fatty acids. Aim for mono-and unsaturated fats (including omega-3s) to be at the forefront of your fat intake: oily fish, avocados, nuts, seeds and olive oil. Don’t skimp on your recovery nutrition. As you get older, recovery from hard workouts takes longer so refuel with protein and carbohydrate. Good options include 500ml milk, 300ml whey protein shake, or 250ml strained Greek yogurt.